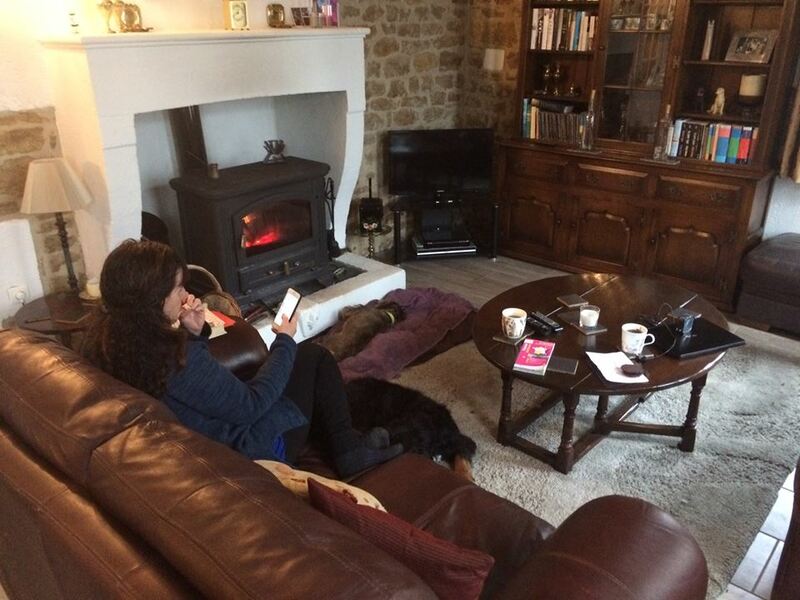 Housesitting in France isn't actually like living in France. We're still definitely more in vacation mode. Each day, we look at the weather and look at maps or the internet to figure out something to do in our region. Yesterday, as Earl was busy with household duties of firebuilding, I said, "Hey, there's an arch built in 19." "No! The year 19. Like the Romans." It's called the Arch of Germanicus and it was originally part of a bridge that was part of a bridge but was taken apart and rebuilt in a different place. 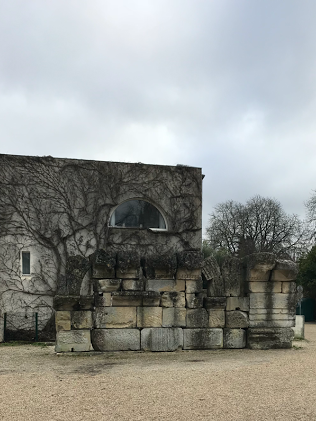 When we left the house, the sun was shining, but when we got to Saintes, the town with the Roman arch, the clouds had taken over. We parked and walked to the arch. That's 6-foot, 4-inch Earl standing in front of the arch to give you some perspective of how big it is. But one thing that we noticed as we walked toward the arch was that it seemed not put together in a careful way, perhaps not even with mortar in between to hold each stone in place. We commented that perhaps someone with more Lego experience could have done a better job. Looking at the arch from the side, the arch seemed even more haphazard. I mean, it was two thousand years old, I couldn't help but think of the woman who repainted the Italian fresco, thinking she was helping. 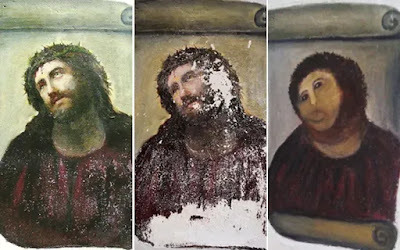 The first painting is the original, the second shows the damage, and the third the woman's restoration. You can read the whole story in the Telegraph story from August 2012. So Earl and I posed in front of the revamped arch and walked around the rest of the town. Looking at some lovely gardens and watching a rooster and peacocks in a petting zoo. As we exited the park, we noticed a number of other stones stacked near the tourism office. "I told you," Earl laughed. "Those are the leftover stones that they didn't put in the arch when they reassembled it." We got directions to the Roman amphitheatre, which was a 25-minute walk, but I had already used my walking energy traipsing around the city, so we drove there and after taking a few pictures decided not to go in and tour it, even though the price was reduced to 1.5 Euros because of the water in the basin of the amphitheatre. 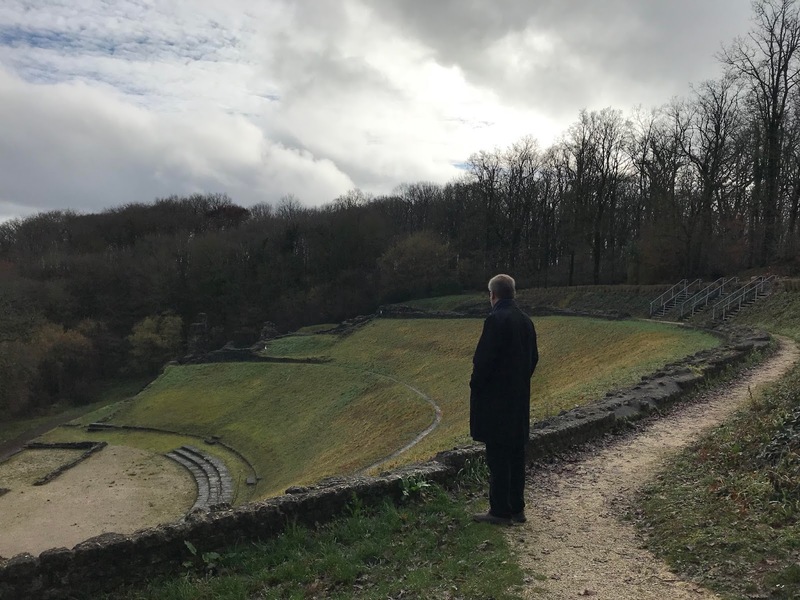 The size of the amphitheatre was impressive compared with the one that we had seen the week before. That one could hold 6000 people, but this one could seat 20,000. I wonder how far people had to come from to get a crowd of 20,000 people in the year 19 AD. Here's a closer look at the entrance to the amphitheater, currently underwater. I wonder what the Romans did to build things 2000 years ago that made them last that we don't do today. Earl says it would be too expensive to build the way they did then, but it seems expensive to repave roads every year or two and to rebuild buildings. Maybe it had to do with slave labor, which I obliviously would not support. But seriously, what have we created that will still be around in 2000 years? Obviously, life in France is going to be different than life in the U.S. so I wanted to share with you a few observations of things that are not the way we would do them at home. For starters, as I've mentioned before, homes don't have central heating with all the rooms warmed. In the house we're staying in, they have radiators in each room. The default setting for the radiators is 8 celcius, which is about 46 degrees Fahrenheit. When we are going to use a room, we turn the radiator on to 15 or 16, which is about 60 or 62 degrees. Now in the U.S., we kept our house at 68 degree, which many people complained about, but if we moved the thermostat up in the 70s, I was too warm. And French houses, often made of stone, hold the cold, probably works well in the summer at keeping the heat out. So in the main room with the radiators turned into the 60s, Earl builds a fire in the stove and we sit on the couch close by. The dogs crawl on top of each other to get the heat radiating from wood stove. Since I've been sick, I've spent more time than I normally would on the couch near the stove, and Earl has searched in vane for a throw blanket to tuck around me. In the U.S., doesn't everyone have a blanket draped over the back or the arm of the couch to cover up and get cozy? Apparently, it's not something that is done here. And this is where a throw blanket is definitely needed. We are staying in a British couple's home in France, so maybe it's just not a British thing. In our old house, we had three in the living room alone and sometimes needed to get more. I guess not everyone covers up with a blanket while watching TV or reading. So, toilets. I know I've written about French toilets before and how they all flush differently. Luckily, I haven't run into any Turkish toilets, the kinds with places for the feet to go and a drain in the middle, but what I have found several times when I've gone to the bathroom in a restaurant is a toilet without a seat. That means you need to squat to go to the bathroom. Now this would suit some of my friends (Leah) who never sit on the toilet anyway, but most women sit on the actual toilet seat to use the bathroom. Come on! I've a very civilized country that should have decent toilets everywhere. A final difference that I've noticed is that every place we have visited in France thus far has had Nescafe coffee makers -- they're the equivalent of the Keurig in the U.S.
One of the things we fell in love with in France was the giant bowl of coffee or tea that they drink for breakfast. Now with the Nescafe machines, the choices here are much more limited. When the homeowner showed me how to make the coffee, she pointed out the three cup choices. Now when I make my breakfast coffee, I make two of the largest sizes and combine them, along with some milk warmed in the microwave, and some adorable heart-shaped sugar cubes to equal a normal, American-sized mug of coffee. Like the Keurig at home, the Nescafe uses disposable cups, and I don't get the attraction. It only took me a minute to put espresso in the espresso cup, add the water and let it brew. Once we have our own place, of course, I can buy an espresso maker and make as much coffee as I want for breakfast. Since I'm doubling up on the morning coffee, I have to use two of the disposable cups. Oh the shame of the extra trash. Speaking of trash, the guy who picks up the trash knocked on our door at 8:30 this morning. He's supposed to come on Wednesdays, but because of the flood last week, he never arrived. Our trash and recycling sat outside for two days before we moved it back into the covered area. In addition to picking up the trash and recycling, he handed over an invitation to the mayor's luncheon and a schedule of the holidays in the coming year when he wouldn't be picking up trash on the regular days. I hope I wasn't supposed to tip him or something. I just pulled out the trash and recycling bags and asked if he would be back on Wednesday, the regular day. Oui, he affirmed. Mercredi. Obviously, France is going to have many differences from the U.S., and the differences are some of the things that attracted us. We're grateful to have a clean place to stay with well-behaved animals and a cozy fire to sit by. When we get our own place in France though, expect throw blankets on the backs of the couches, an espresso machine with a reusable filter, and a seat on the toilet. Thanks to all my new readers who are coming along to watch the fun-- or carnage -- of my adventure of moving to France. If you haven't read my novels, I hope you'll consider downloading on Kindle. 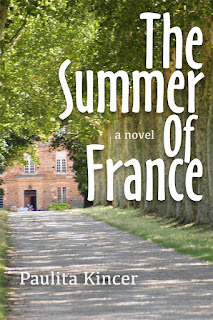 Through Sunday, my first novel, The Summer of France, is only 99 cents. I'd appreciate if you'd give it a try and leave a review. Click on the book and it will take you to Amazon. This is only for the U.S. edition. I'll have to figure out how to include the UK edition and let you know when it is reduced. Friday morning the rains had stopped and the sun began to shine in some Biblical Genesis way. After being stranded on Thursday, we were determined to get out of our isolated island on Friday. First, we took the dogs for a walk, exploring the roads that would lead us to civilization. The current was fast across the road in one direction, but not too deep. In the other direction, I handed Earl the dog leash so he could hold both dogs while I walked through the deepest section. It didn't top my boots, which come to my knee, so we knew that even though the water looked deep, we could ford that stream. We decided to go to Bordeaux, which is about an hour and half away. We were missing cafe life and pictured sitting in a square with the sun beaming on our faces. After we showered and readied the dogs for their time in the house alone, I pulled up my weather app. It predicted heavy rain in Bourdeaux! How was that possible when the sun had forced us to don sunglasses? Can you see the mistake I made when I searched for the weather in Bordeaux? I misspelled it and got a Bourdeaux somewhere else in France -- 400 miles away. But we didn't catch the mistake before we ditched our trip to Bordeaux. We needed to stay in the sunshine. We decided to drive to Jarnac instead because it had a market going on and it's less than half an hour drive. Plus it has a Cognac house there -- Courvoisier. Our host served us some cognac the night we arrived. I think it must be an acquired taste. I had only a sip and felt the burning through my throat. Although, perhaps I should try it as a cold cure when I'm not drinking pastis. I plowed ahead through the shin-deep water with our Citroen C3 and safely arrived on drier ground. Earl and I shared a fist bump at making our escape from the flooded island. Driving is when I get my most French practice because the GPS is in French. À la fin de la route, tournez à gauche, she'll say (at the end of the road, turn left), allez toute droite (go straight ahead) or dirigez à droite (veer to the right). Living in the country definitely curtails my French practice. Sometimes we share "bonjours" with the men fishing along the long or other residents walking along the country road. For the most part though, we're isolated with our English speaking. We made it to Jarnac and speedily found a parking spot at city hall. The sign warned only 90 minutes of parking, but the hours were from 9-12 and from 2:30-6. Luckily, we parked at 11, so we had until 3 to move the car. Thank goodness parking wasn't enforced during the requisite French lunch hour. Inside city hall, we asked for the location of the market, le marché, which wasn't apparent. In the summer, the markets fill up the "centre ville" but in the winter, this market is inside. The man directed us down the hill and to the left (more French directions). We walked into "les halles" where we were immediately assaulted with the pungent odor of fish. Once our eyes stopped watering, we saw fruits, vegetables, a coffee bar, meats, cheeses, bread and pastries. We loaded up on baguettes, some croissants for breakfast the next day, two types of cheese and some luscious red tomatoes. Once we returned the bag to the car, we still had some time to kill. We decided to walk around Jarnac and read the lunch menus in preparation for our next big event -- lunch. The Courvoisier Chateau, which means castle, but apparently when you make alcohol the house is called a chateau, too, stands along the river, so parts of the riverwalk were underwater here. They give tours from May through September, but during the winter months, you have to reserve ahead of time. We might look into a tour of a cognac maker in the next few weeks just to see the process. Through the window, we could see the barrels of cognac. I wonder if these are actually filled since the light and heat from the sun might affect how the alcohol ages. I guess I'd have to take a tour to find out. Jarnac didn't have a lot of open restaurants to choose from, but we ended up at l'Alambic. We usually try to choose a restaurant that has a menu of the day. Frequently, we end up paying between 10 Euro and 13 Euro for a three course meal if we go with the menu of the day. This restaurant had several things on its "menu" that I didn't recognize, so we ordered individual entrees. A goat cheese and honey salad for both of us. You can see the goat cheese on toast, along with slices of oranges and pears. After our lunch, we stopped at the pharmacy for more Fervex. I'm feeling better, but my cold may have mutated into a sinus infection. I've promised myself if I'm not feeling really well on Monday then I'll find a doctor. But this Fervex helps relieve the symptoms beautifully. When we got home, we took the dogs for a long walk, Earl still carrying short Jeff through the deep parts. We waded along the road and noticed some swans paddling toward us. They were amazing. If the fields hadn't flooded, we wouldn't have captured this magical swam moment. I took several shots of the swans and I wondered as I watched them if they might not have been mistaken for the Loch Ness monster as they dipped their heads in the water in search of food. They are huge. Another pair of swans flew in and landed as I tried to capture their flight. As we walked on wading through the rushing water, we came to a church in Angeac-Charente. The sun was setting just behind it and the clouds looked ominous. Our hosts had told us about this church, but when we read the sign on the door, it looks like they aren't having mass here during the winter. The local mass is at 6:30 on Saturday in another nearby village. Walking home, having actually reached my 14,500-step goal for the day, I felt thankful for the flood which brought me the swans and the magical sky, and grateful for a day of good meals and wet dogs. A day in France living my dream, cold or no cold. Yesterday I shared our harrowing adventures of escaping this island where we are housesitting. We had already decided that today we would stay home because the water continues to rise, even though we avoided rain yesterday. But last night, Earl had a date with some English-speaking guys at a nearby restaurant. He was dreading it, walking through the dark roads with water up to his knees. The slightest excuse would have convinced him to stay home, but he bit the bullet and went. I stayed here grading papers, and it wasn't until after he had gone that I began imagining him walking the half-mile home after a few drinks. It's dark out here. Super dark with glorious stars when the clouds move along. I wondered if Earl would remember his flashlight (his torch the British guys reminded him) on his phone. What if he wandered away from the road and actually ended up walking in the river? He made it home a couple hours later and was glad he went, although the flood waters splashed into his boots and left his feet wet, again convincing us not to try to drive through the exit routes today. This morning as we walked the dogs, we explored both roads that lead out of this river-bound neighborhood. Where does the river end and the road begin? Toby can't tell anymore. We ended up carrying Jeff, the dachshund, who did fine until the water got to his belly. I know what he's going through. I've gotten in a cold swimming pool with a bikini on and the belly is the worst part. The other dog, Toby, just kept plowing on and even found a little fish to eat. We stopped just around the corner from a restaurant, a nice one with a hotel. That's where Earl walked last night and that's our back-up if we need to get out of here. We can walk there, carrying dry shoes with us. As we started back, a farmer on a big red tractor in the field over waved and I waved back. He must be able to go wherever he wants with those giant wheels. Maybe he'll even drive back and deliver some fresh bread to our isolated house. At the end of our walk, my socks and pants were wet, but I soaked in the bathtub with a cup of tea, then made omelettes and fried potatoes for lunch -- no bread. The afternoon and evening stretch out before us as the rain has started again and plops against the skylight window panes. Yesterday, we made it to the pharmacy and when I took the magical hot liquid overnight, I slept until 8:30 this morning and woke to the sun piercing the clouds this morning. I'm usually an early riser, at 5:30 or 6 a.m. in time for a run. But since I can't run currently and I'm healing from my cold, I will embrace the extra sleep. 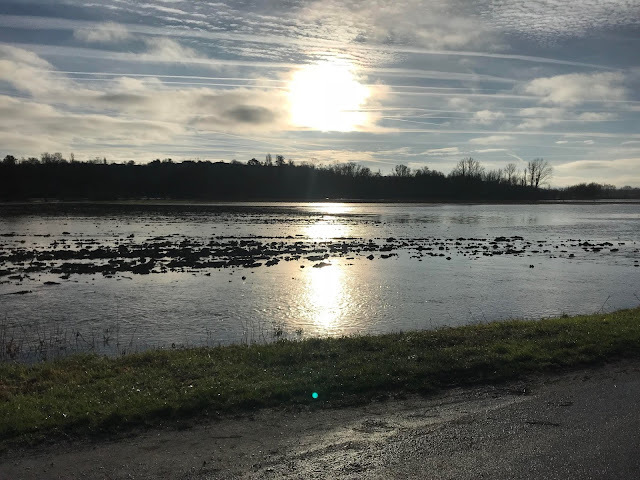 We took the dogs for a walk and discovered that the river has risen over many of the paths that we walk. So we meandered back and forth, turning around when the water got too deep for Jeff the dachshund. I know, Jeff is an awful name for a dog. I can't figure out why the name Jeff is so bad when Jack seems like a fine name. 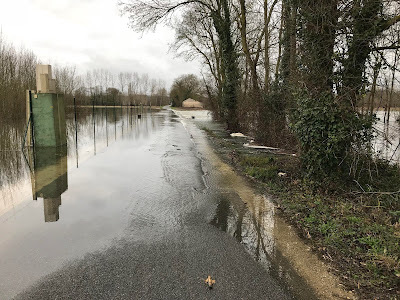 The house we're staying in is dry and the lock is not threatening to overflow, but as we walk down the path to the bridges, the river has breached its banks, topping the road and running quickly to the fields on the other side. We generally let the dogs off leash at a field, but that way is blocked. This time we came down the road and I decided we should let the dogs off the leash. Jeff stopped in front of a gate that is padlocked. After staring for a minute, he slipped between the metal bars and disappeared. Earl and I, with the bigger dog, Toby, stood at the gate calling Jeff and holding out a treat. We could see him frolicking amidst a ramshackle trailer and woodshed. Finally, Earl hoisted himself over the fence and went after Jeff. He handed the leash to me and I pulled his long, muscular body through the gates while Earl again climbed over, avoiding a tumble into the mud. Since the sun was shining, we decided to visit some Roman ruins about 10 miles away. But first, we had to drive through the flooded roads. The first one, I clenched my teeth and drove through, keeping it at a steady speed as the water kicked up all around us. Then I went over the bridge and stopped on a dry patch of road. Ahead of me, the road turned to the right then the left. I knew that, but I couldn't see it because it was covered with water. I could see two men who worked at a restaurant standing in the parking lot and watching the road. A couple on a walk stood beside them, all of them looking at our car and that flooded road. "Just go," Earl urged. "You won't get swept away. The worst thing that might happen is that I have to get out and push." 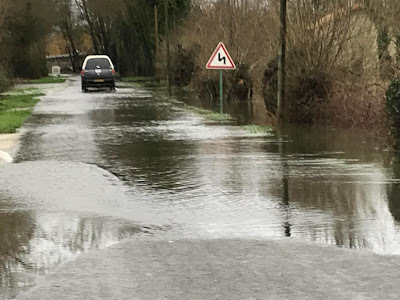 I paused for several minutes, made a plan to drive at the side of the road where the water might be the shallowest and I started forward. Luckily the tires didn't leave the asphalt as we made it around the corner to the right and then the left. We traveled through the sunshine to the Site Romans-Gallo near Rouillac. Apparently there was a temple and an amphitheater that held 7000 people. It was built the 1st through 3rd centuries. 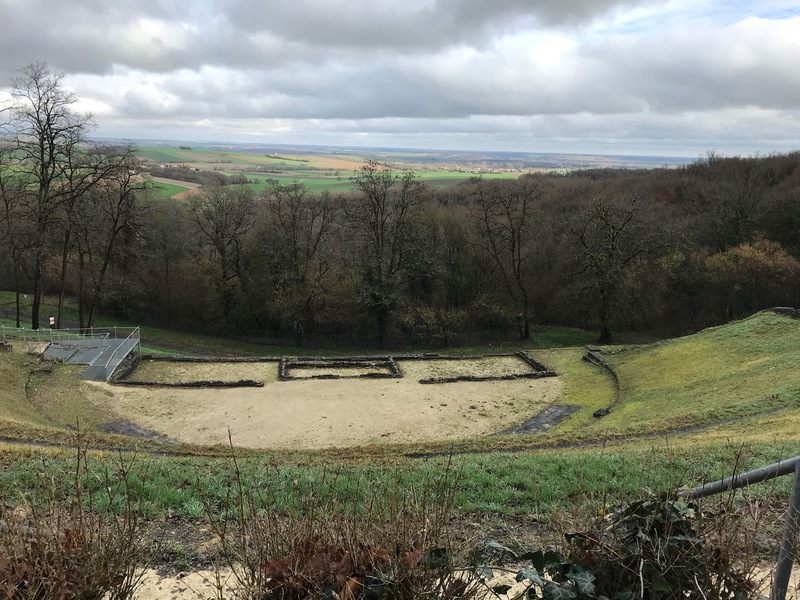 Obviously, they built the amphitheater on a hill with a great view of the surrounding areas. Seeing Earl here gives it a bit of perspective. We made our way down to the stage and I began to sing "Rain on My Parade." "Don't tell me not to live, Just sit and putter, ... Don't tell my not fly, I've simply got to..."
"She'll be here all century," Earl announced to the imaginary crowds. Even climbing and exerting myself within the amphitheater took its toll and I could feel my energy waning. We decided to go out for lunch and drove to Cognac, yes the city that shares the name with the alcohol. We found the town's main square and skipped the restaurant that was offering steak de cheval. We ended up with salmon and potatoes and Cesar salad, which seemed appropriate when mixed with the day's outing to Roman ruins. With the weather hovering around 60, we ate outside, but drank some hot wine to compensate. This might have been better served in a mug rather than a stemmed glass. The flag of France flew behind Earl's head. 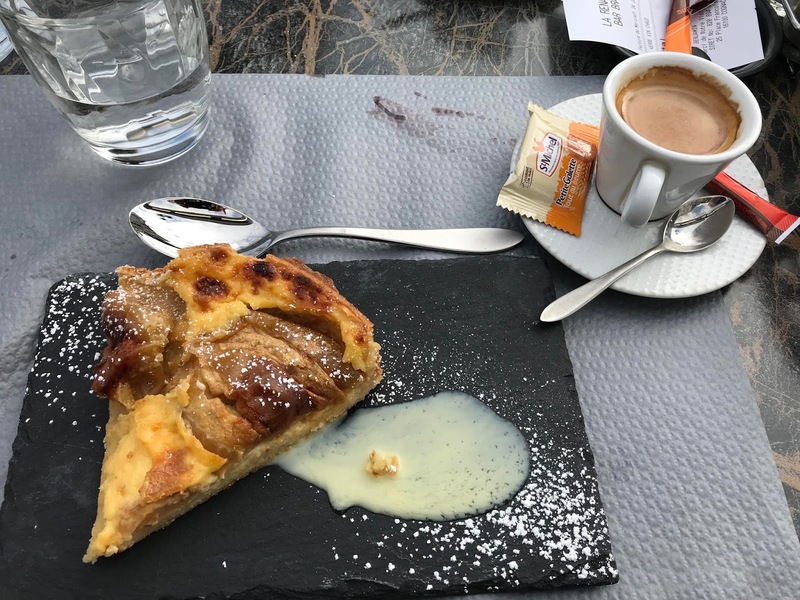 And we finished the lunch with tarte alsacienne and coffee. It's an apple and custard tart. Then we drove back, having to turn around once because the road was flooded. This time Earl drove and as we went through the flooded section, the water made frothy waves around the hood of the car. We may be stuck here for a day or two until the river subsides. I just wanted to touch base with everyone after your outpouring of support. I know that some people might keep their doubts and fears a secret, but that has never been my stance. I lay it all on the line, so if I'm doubting my dream life, you're going to know about it. I had a tough night, up coughing, but I got a lot of sleep in between. A morning walk with the dogs in the mist, just grateful it wasn't raining. After I worked on my online class, we went to the Super U, which is a WalMart-style grocery store. The only thing it doesn't have is a pharmacy. After buying our groceries, we realized that neither of the two gas stations in town have diesel gas. We're going to have to take a trip before too long to fill up with gas. We stopped in town and the bakery was closed for lunch, as was the pharmacy, so I didn't get any medicine, but Earl did find a few doses of Theraflu in his suitcase, so I can take that tonight. Earl was napping this afternoon because he is getting sick again, after successfully beating this cold during our first housesit. So when the sun came out this afternoon and he was sleeping, I put the dogs on their leashes and we walked about 45 minutes in the sunshine. Cognac vines dormant in the winter sun. We're catching up on Netflix series, like The Crown and Grace and Frankie and last night we watched the movie The Way with Martin Sheen since Earl will be walking part of the El Camino de Santiago in June with Maurice, the husband of fellow-blogger Linda Mathieu at Frenchless in France. See how blogging can connect people? Thanks again to everyone for your support and concern." I ain't gonna quit. I got nowhere else to go!" What happens if you plan your life around a dream and then it doesn't live up to the expectations? Well, I've had a rough start to my dream. 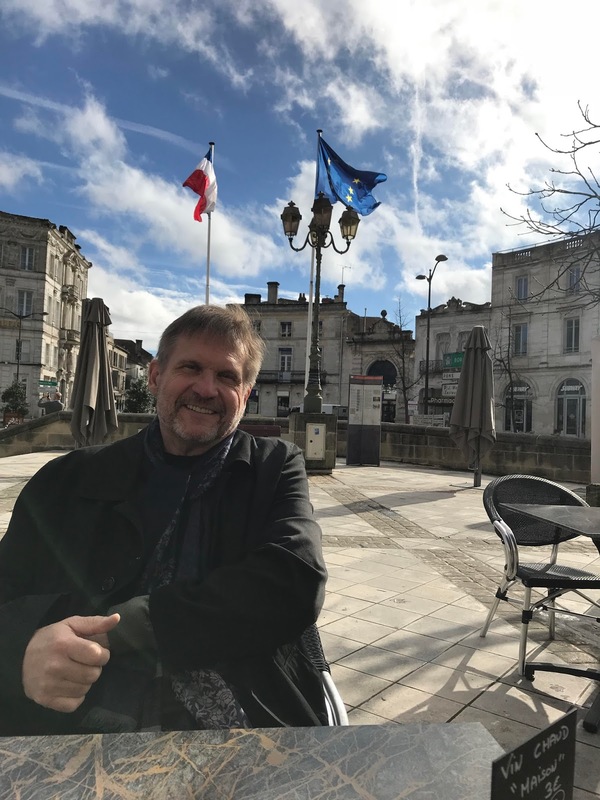 We've only been here in France seventeen days, and if I hadn't made commitments to people and pets, I would be tempted to catch our scheduled plane home on January 25. We bought round-trip flights because it was cheaper, with no intention of take the flight home. We're in the middle of a housesit, taking care of two dogs and two cats in a lockkeeper's house in the Charente, France. I can picture taking a train to Paris and checking in at the airport with my one bag (I've stowed the other at a friend's house). I would march through the airport and then curl up in the tiny airplane seat, coughing desolately into my inner elbow. When the plane landed in Florida, I'd rent a car and drive straight to my parents' house, dragging myself to the lounge chairs by the pool where I would lie down and sleep, letting the sun beat onto me and dry out the hacking cough that continues to plague me. I'm sure that Tupi would climb onto my lap at some point. That fantasy has replaced my lifelong dream of living in France. Of course, a cold can't last forever, and it's a good thing that I made commitments so I couldn't go running back to my parents' house at the first sign of difficulty. 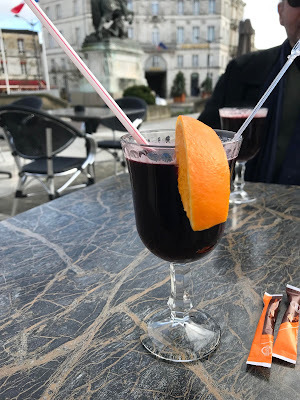 Those first few days of our trip when we landed in Paris were lovely, walks and runs, lovely meals, wine and cheese tasting, a day spent wandering at the Louvre. Then the stress of the train trip to our first housesit. We were traveling with four suitcases and two carryon bags. That's a lot to maneuver. Our first housesit was a disaster. My gag reflex still kicks in when I think of it. The only clean place in the house was the upstairs section where we slept. Unfortunately, there was no heat in that section, which probably added to the cold that I fell prey to ten days ago. I don't get sick very often. If I do, I go for a run to slough it off. This one has resisted. I've never had bronchitis, but I guess that's what I've had as the air crackled through my chest. I must have looked atrocious because people are saying how much better I look now. One of the reasons I love France is the food, and this illness has affected my tastebuds and my appetite. For about five days, I wasn't hungry. I Facetimed with my parents last week and my mom said I looked like I'd lost weight. I may have, but not as much as I should have since I've totally given up food. I drink coffee, another one of my favorite things in France, and it all tastes burnt. I left a glass of red wine setting on the counter because it tasted too strong. On Thursday, my appetite returned. 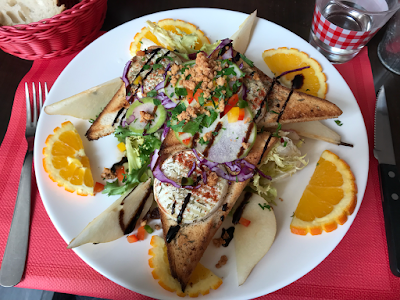 To celebrate and treat Delana our hostess, we went out to eat at a little restaurant on Cours Mirabeau. Delana and I shared foie gras on toasted triangles of sweet bread while Earl started with a pumpkin soup. Then I ordered duck along with delicious mashed potatoes. I could only manage a few bites of each, but at least something tasted good. I poured the rest of my wine into Earl's glass. On another night, we might have ordered a dessert to share or lingered over coffee, but I had hit a wall. 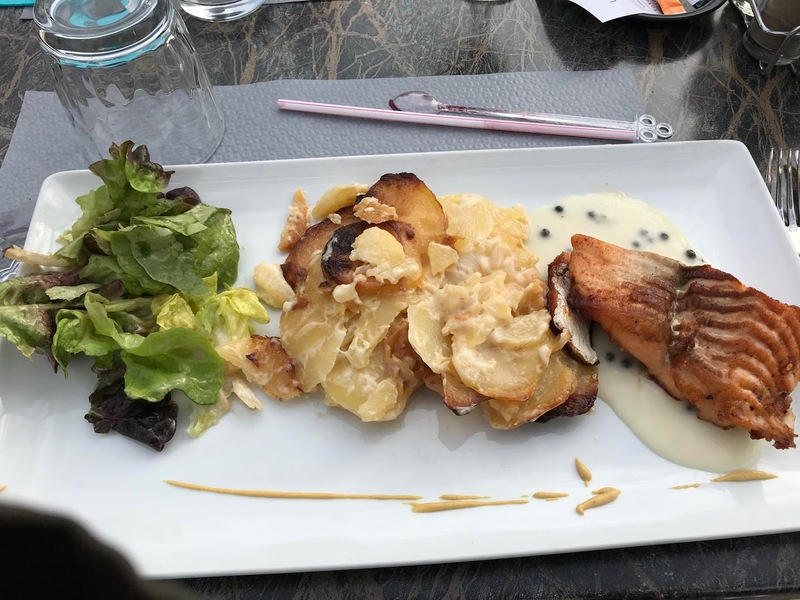 My husband and my friend were both considerate and asked for a doggy bag (apparently this is required in France now) for my meal, and the check. We staggered home and I fell into bed again. Friday we travelled to arrive at our next housesit. If the place was disgusting, we were prepared to turn away. This housesit is scheduled for three weeks and we would not put up with sub conditions again. I won't bore you with the details of the trip, the twists and turns on tiny roads rather than freeways that took us 9 hours to get here (a six hour trip), but when we arrived, we felt a relief. Caroline, the homeowner, directed me to the "loo" and I saw the pristine floor, smelled the crispness of the wood-burning stove but no hint of dog urine or cat litter boxes. Thank, God. They had prepared a meal of pasta and Bolognaise sauce along with red wine. Afterwards, we climbed a centuries' old wooden staircase to the bedroom with vaulted ceiling and the attached bathroom. Radiators in the bedroom could keep it warm, although the warmth from the wood stove below helped heat it as well. The dogs are new adoptees, but they're well behaved and don't pull on the leash during our twice daily walks. I'm still not enjoying coffee or wine the way I should, but I did relish a ham and butter sandwich that Earl made for lunch yesterday, and ate up the leftover Bolognaise sauce for dinner. I'm still sniffing and coughing and perhaps dreaming of returning home to see my kids, my parents and the sun, but I have to be realistic. The weather at home in Ohio has been awful -- snow and more snow and below zero (Fahrenheit) temperatures. I sold my house. I packed up or gave away all my belongings. There's no point trying to go back to a life that will be totally different. I need to give it a year. Then, if I want to return to the U.S., find a full-time job with insurance to support me and Earl, we'll still have that money tucked away ready to invest in a house. So I guess that's the real message. If you embark on a dream, make sure you have seared the ties behind you so that it isn't too easy to simply turn around and pick up the reins of the previous life. Cause if I turned around now, I'd never know what might have been in my France dream.